New Zealand and Hawaii. Remote Islands and Why Each One Is Different. Given the many problems caused by humans to the various species living on Pacific Islands, their rapid decline seems inevitable, but to a degree this process was happening naturally, long before we showed up. Such losses and gains were, and still are, dependent upon many factors, but as a general rule, smaller islands exhibit a greater turn over than do larger islands; and the arrival of man has now pushed the losses to the level of a major extinction event, with both New Zealand and Hawaii exhibiting clear examples of the problem. I mentioned Hawaii’s carnivorous caterpillars in a previous article, and do so again because they are such a great example of the unusual directions that evolution can take on islands largely isolated by distance. So far as we know, meat eating caterpillars occur only on the islands of Hawaii. 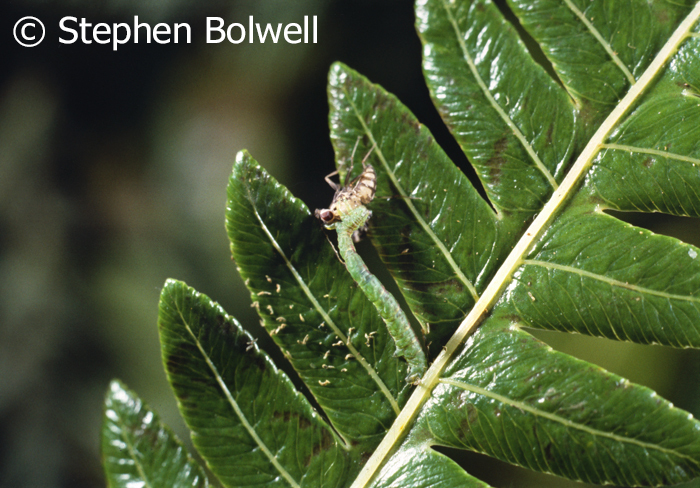 To remain camouflaged, this carnivorous caterpillar Eupithecia ochrochloris has cut a notch into a fern leaf. It has caught and is eating an Hawaiian fruit fly. 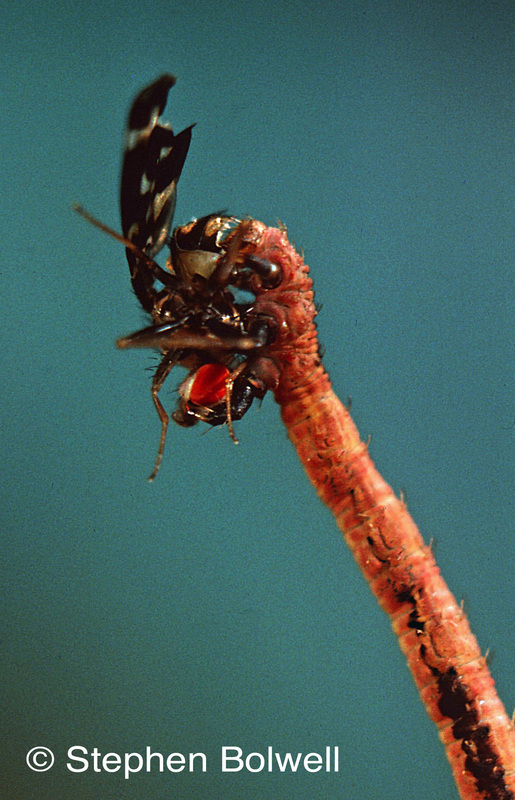 The fruit flies of Hawaii are themselves unusual varying greatly in form in comparison to the tiny fruit fly Drosophila melanogaster commonly seen elsewhere and used as research animals in laboratories. How plants and animals get to be on a remote island in the first place depends on several things: the size and topography of the island, and its position in relation to other nearby islands is important; as is the distance these islands are from major land areas that might act as starting points for new arrivals, and this is critical both to what will arrive and how frequently; any organism capable of parthenogenesis (the development of embryos without the need for fertilisation) will have a better chance of getting started than will animals that require both males and females for reproduction. Each and every island has a unique story held in its geology. Consider Australasia – around a 100 million years ago this huge land mass separated from Godwana (which was at the time a supercontinent). The split from Antartica happened between 37 and 35 million years ago as it moved northward. The land that would eventually be New Zealand started moving away from the larger mass we now call Australia between 60 to 85 million years ago. New Zealand has many beautiful beaches, but inland the environment is significantly different from the way it was before man arrived. From the seaward side bands of native and often non-native trees give the impression of a still wild place, but once through the trees, more often than not, you’ll find yourself standing on sheep or cow pasture. It is possible that NZ once formed part of a drowned continent, but for the millions of years the two main islands have remained above water in one form or another, extensive changes have occurred — including climatic extremes which will have eliminated many life forms. Initially, when New Zealand sat alongside Australia, both were set in the same sub-tropical waters and in consequence had similar floras, but as the two separated, the sea flooded into the rift between them and formed the Tasman Sea. In consequence the New Zealand flora became isolated and new species began to evolve. For the last 55 million years N.Z. has held its current position at around 2,000 kilometres to the south-east of Australia and experiences a much cooler climate than it once did, but ironically it now appears to be moving slowly back. 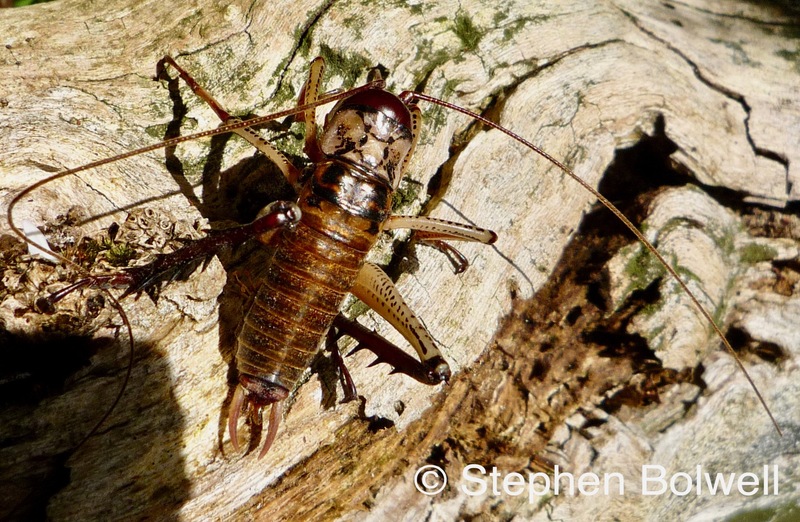 This Weta is one of around 70 species that occur nowhere else but New Zealand. This individual found its way onto my neck in our NZ garden, and when I tried to brush it off, it slashed out with its rasping rear legs and drew blood. A lot can happen in 55 million years and the fine detail will always remain uncertain, but nevertheless there is clear evidence that a great many species have come and gone during that period with most of the present New Zealand species of recent origin. Everything in this picture is native to New Zealand… but no doubt, some hawk-eyed individual will see something here that proves me wrong. and none managed to colonise successfully until the arrival of Polynesian settlers less than a thousand years ago; this was followed by a second wave of mammalian competitors that came along with Europeans when they began settling little more than 250 years ago, with dire consequences to the established native species. 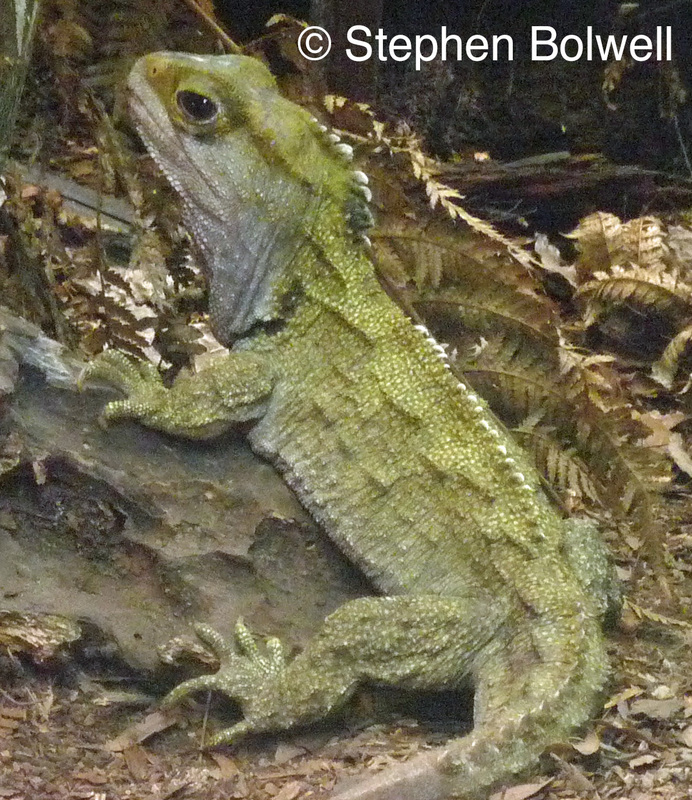 Tuatara Sphenodon punctatus– one of the ‘distinctives’ — an ancient reptile that evolved in NZ. They appear to live forever and I’ve never seen one move. Prior to the arrival of humans and their entourage of plants and animals, New Zealand had been populated by a very distinctive flora and fauna that developed in isolation of the many mammalian predators evolved elsewhere. A European botanist arriving for the first time might initially consider that they had landed on another planet, because the invertebrates, amphibians, reptiles and birds that fill the niches taken up by mammals elsewhere, are so extraordinary. 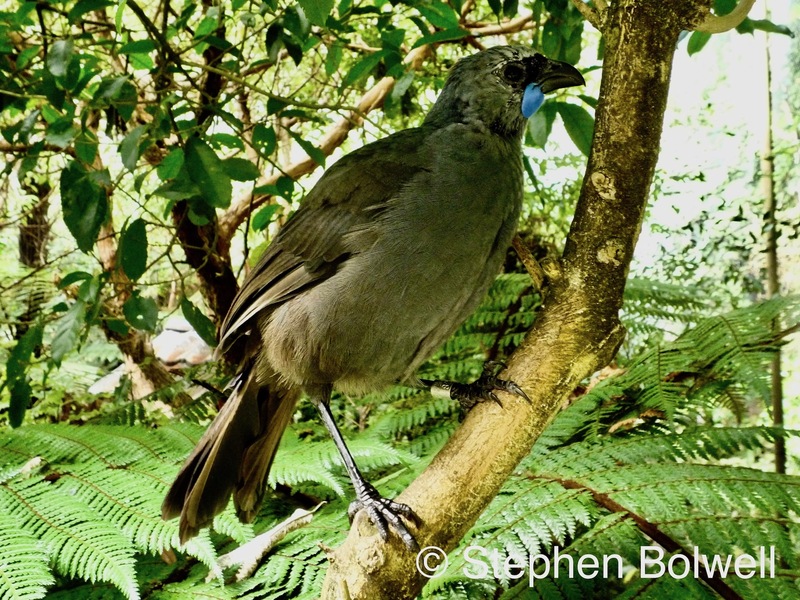 The North Island Kokako Callaeas wilsoni is also distinctive and although its survival has been tenuous, isolated groups remain in only a few places on the North Island; the bird is mostly restricted to offshore islands where introduced mammalian pests have been eliminated and the birds then introduced as a conservation measure. Until fairly recently there was a South Island Kokako which had a reddish orange wattle but this species is now thought to be extinct — the last definitive sighting was at Mt Aspiring National Park in 1967, but there are suggestions of more recent sitings and the species’ conservation status was moved from extinct to data deficient in 2013. Waimea Falls – Kaui, Hawaii. New Zealand has been around for some time, but the Hawaiian Islands were formed far more recently and exclusively by volcanic activity — they quite literally erupted from the depths of the mid-Pacific and are about as remote from any other land area as it is possible to be. The first island, Kaui, started to push above water around 5 to 6 million years ago and is now the most westerly island in the chain. 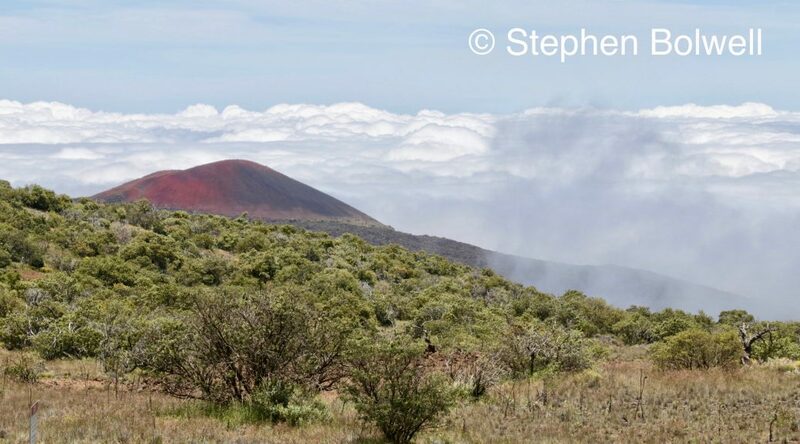 To the east at the opposite end is the Big Island (Hawai’i), and at less than a million years of age is still volcanically active. Recent lava flow features prominently on the Big Island Hawai’i in a way that it doesn’t on other Hawaiian Islands where lava is integral to the way the islands were formed but is no longer flowing. The older more established islands have moved on and consequently they no longer sit over the hot spot beneath the Pacific Plate responsible for volcanic eruptions. Hawai’i is not huge, but nevertheless, it is big in comparison with the other islands in the chain. At around 10,500 square kilometres it is larger than the rest of the Hawaiian Islands put together, making up more than 60% of their total landmass. Once the islands were formed, the possibility of a new plant or animal arriving on these tiny specks in the Pacific Ocean became a lottery. Miss the islands by only one mile or by a thousand, and the result would be the same — oblivion. Small organisms produced in large numbers will have had the best chance of arriving, with spores, seeds and tiny creatures the most likely candidates to be carried successfully on mid-altitude air currents to land against the odds on distant islands, although most of course will have perished. Small creatures like shore crickets might have arrived carried on flotsam. Some species might have arrived carried across the surface of the ocean on any material that could stay afloat long enough to make landfall, but again the attrition rate would have been high and the chances of success slim. It was a long shot that birds would arrive on Hawaiian Islands at all, given the distances involved, but when it did happen they would most likely have been carried on mid-altitude air currents. It is quite possible that only one or a small number of finch species arrived to become the honey creepers that radiated out across the Islands filling different habitats as they evolved into the 56 species that have been recorded, 18 of which are now extinct. This article links: The Down Side of Remote Pacific Islands – The Disappearing Species of New Zealand. and: The Down Side of Remote Pacific Islands – The Disappearing Species of Hawai’i. 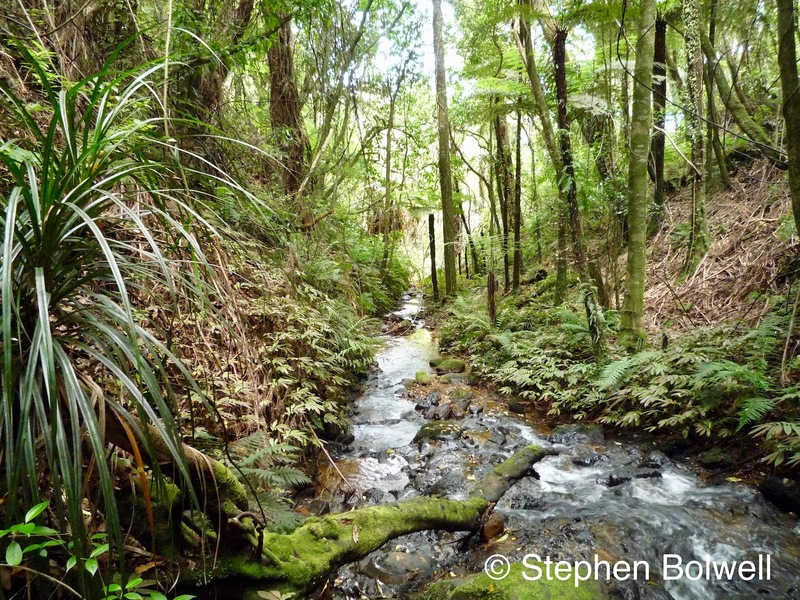 The Down Side of Remote Pacific Islands – The Disappearing Species of New Zealand. Hawai’i is the third largest island in the Pacific after the North and South Islands of New Zealand. Each has a reputation for beautiful landscapes but all have experienced extraordinary losses of their unique flora and fauna. When man arrived on Pacific Islands, most low altitude habitats were rapidly degraded and indigenous species either lost or pushed into rapid decline; but sadly many people fail to recognise the problem. On islands where there are higher altitudes many indigenous species cling on, but invariably they are compromised in some way, in particular by introduced pests. 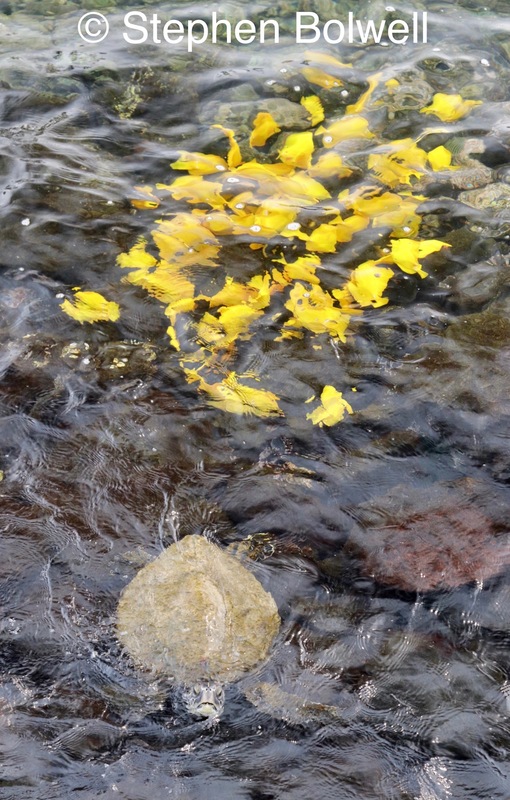 Green Turtle and YellowTangs close by Pu`uhonua O Hōnaunau National Park. Hawai’i. Most species found in seas around Pacific islands usually belong there, with the chances of seeing a varied bio-diversity improving considerably in protected areas, but once out of the water and up the beach, the situation rapidly changes. To the casual observer Pacific Islands appear idyllic and it might seem peevish to dwell upon their environmental problems, but the losses are impossible to ignore. The Hawaiian Islands exhibit one of the highest species extinction rates of recent time, with New Zealand running a close second. Tidal zones are difficult for us to control and the reason so many remain natural, but once inland it is often easy to repurpose wild areas to our own ends. 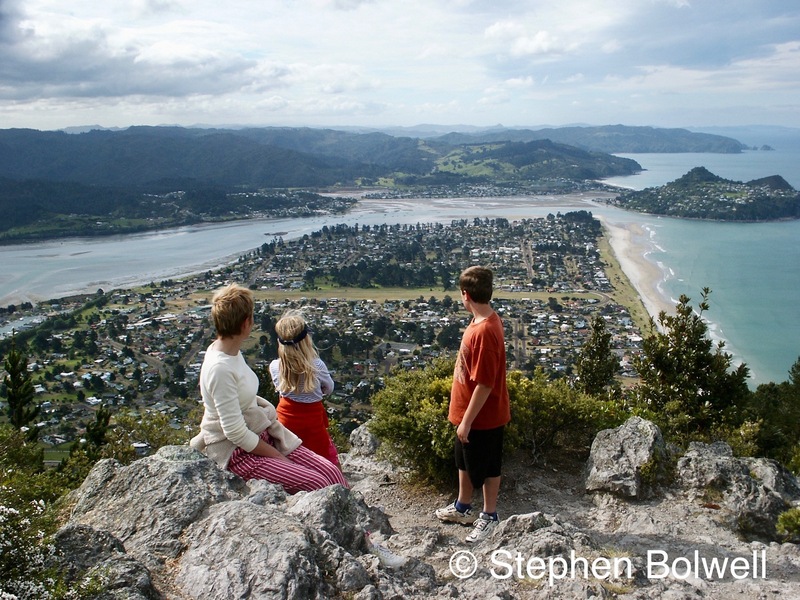 A NEW ZEALAND STORY: When I first visited the Coromandel Peninsula – not far from where my family and I once lived on New Zealand’s North Island, the experience turned out to be very much different from expected. It was perhaps too hopeful to see expansive forests of native trees – there is a forest park here, but the ancient native forests have mostly been replaced by serried ranks of introduced commercial radiata pine along with open pasture, and this was a double disappointment. The degradation of the landscape becomes very apparent when commercial trees are harvested. Many people are fooled into thinking non-native trees growing on hillsides are natural, but nothing in this landscape really ‘belongs’, apart from the tree ferns growing just below the centre line, and this is rather depressing. Ironically, Pinus radiata does not grow well in its native habitat around Monterey in California, and do much better as plantation trees in a goldilocks zone that runs in a band around the Southern Hemisphere. Growing quickly in their ‘new environment’ they may be cropped in a little over 30 years. Such rapid development makes the wood almost useless unless pumped with unpleasant chemicals to preserve the timber from the elements. There is no shortage of Pinus radiata growing on the Coromandel, but at least the Peninsula’s agreeable coastline of beaches and cliffs is cloaked in native pohutukawa trees. Sadly, some trees are prone to suddenly die: this correlates directly with a tree’s growth spoiling somebodies cherished view. 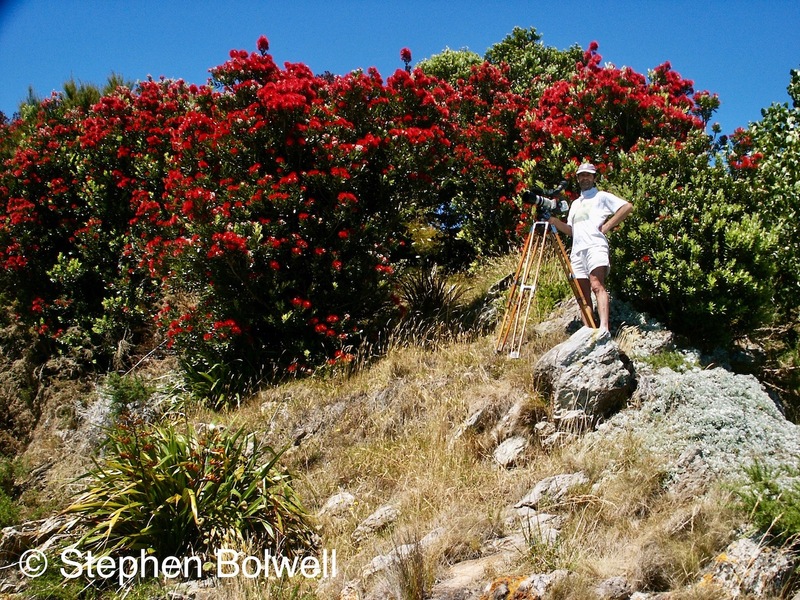 Flowering rata and Pohutukawa Metrosideros excelsa turn some regions into a sea of colour with Pohuts a spectacular feature of the Coromandel. This picture however, with very young trees, was taken above a beach on the South Island in the Abel Tasman region. 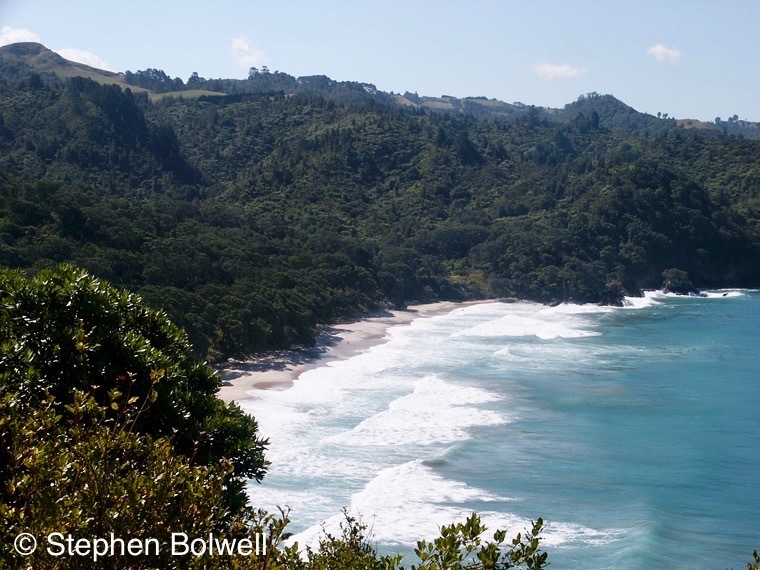 The beauty of the Coromandel relies heavily on narrow bands of coastal pohutukawas. They are visually impressive trees, especially when viewed from the sea, hanging on cliff faces. 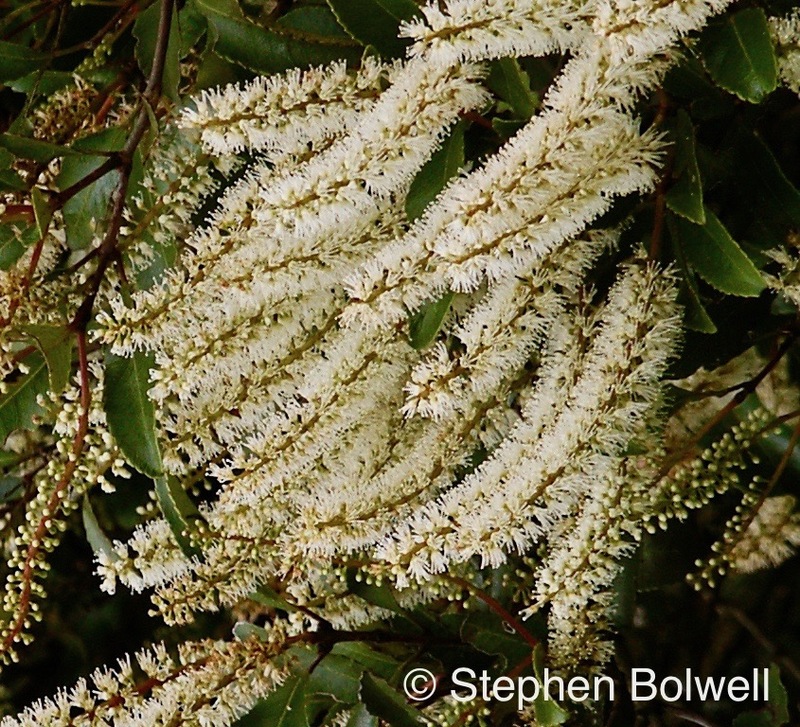 Known as the New Zealand Christmas tree, they flower spectacularly from December into the New Year. However, once up the beach and through the trees, we discovered the landscape changed rapidly to farmland not dissimilar to the countryside we had so recently left behind in Southern England. 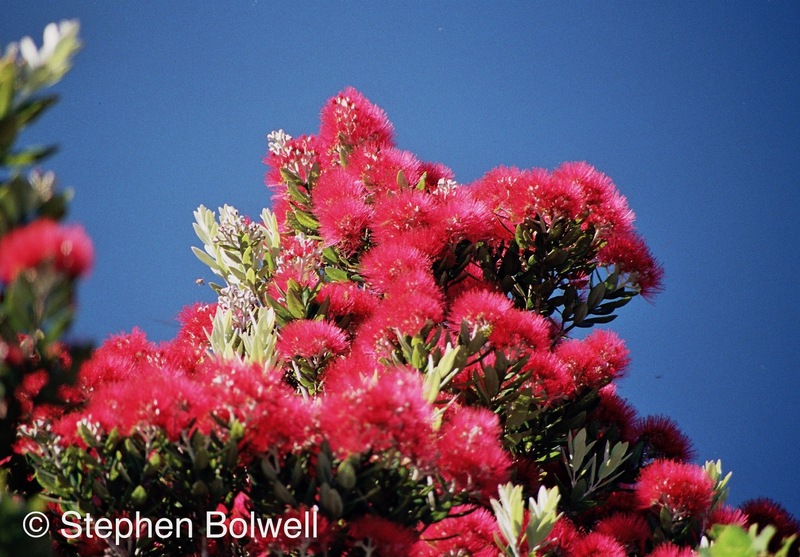 Intensely red pohutukawa flowers set against an electric blue sky – once seen never forgotten. Inland natural habitats quickly begin to deteriorate and when you’ve moved to the opposite side of the world with the expectation of great natural beauty, it is disappointing to find environments trashed and the native flora and fauna seriously depleted. Where did all the trees go? When Captain Cook first sailed along the Huaraki Gulf off the Coromandel Peninsula he wasn’t just mapping the coastline, there was also an expectation that his expedition might find trees suitable for providing masts and spars to the British navy. The 20th and 21st day of November 1769 were days of discovery as Cook’s party took two longboats on an historic journey up the Waihou River. Cook mentions massive trees on the river banks in his journal, these later identified as kahikatea or ‘white pine’, Dacrycarpus dacrydioides. The party rowed ashore and measured a large specimen that ran to 89 feet (about 27 metres) to its first branch and at six feet from the ground, the trees girth was 19 feet 8 inches (almost 6 metres). Later, the publication of Cook’s journal would bring major changes to the Hauraki area; within 25 years the region would be rapidly colonised by Europeans; the trees that Cook had written about felled, the surrounding lands drained and most of the natural forests replaced by farmland. My family on our first outing to the Coromandel, above Pauanui in 2002. The view is very different from how it would have been when Cook sailed by in Mid-November of 1779. We had to get up high to find anything native (there were only the pohutukawas at sea level). Manuka – Leptospermum scoparium is in flower on the lower left hand side of the picture – a beautiful native that should be everywhere, but it isn’t. The discovery that money can be made from manuka honey, and the claim that it has ‘medicinal properties’ has increased its popularity, although, several years before we arrived a virus had eliminated it from our area, and I reintroduced it. It is rather sad that in New Zealand there needs to be very good reasons for allowing native plants to grow unhindered – the general feeling on the Waikato is that they are a bit of a nuisance. Manuka Flowers in our garden. 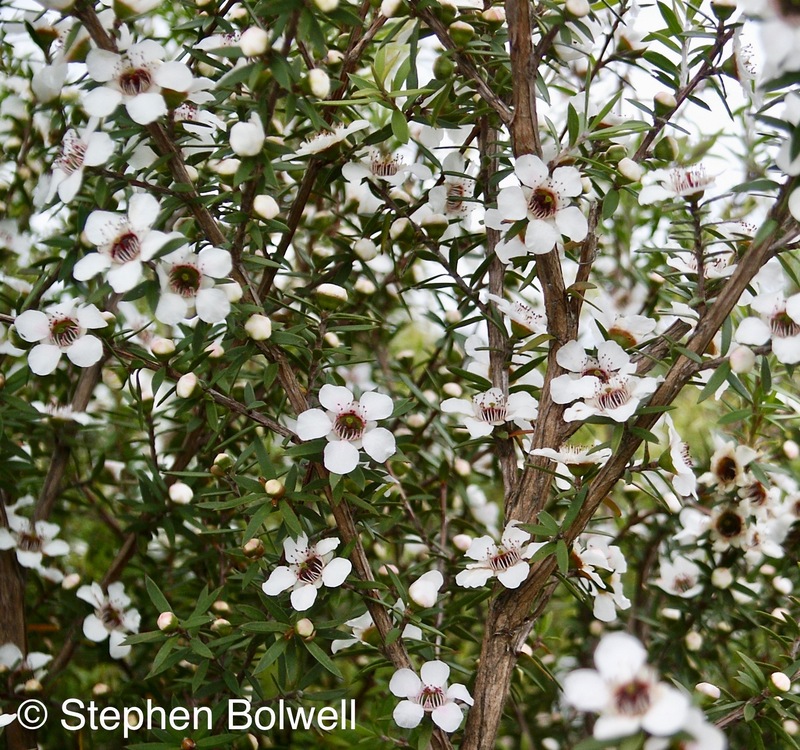 Otherwise known as the tea tree, the manuka plant can be brittle and survives best when there are other plants growing around it to give shelter. Few kahikateas trees survive today as large as the one that Cook described, and on first reading his account I wondered if the tree that had been measured was in fact a kauri. Kauris grow to become magnificent trees, and at that time there would have been no shortage of them. Left to themselves they might stand for thousands of years and reach a spectacular girth; younger trees were so clean and straight they quickly became a favoured choice as ship’s masts, although at the time Cook had not yet come across one. 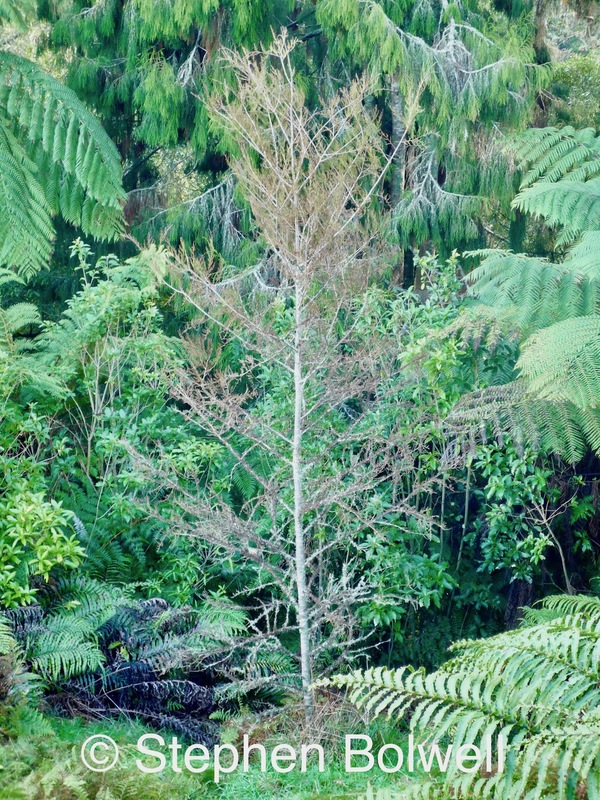 The diameter of the tree he described in his journal would have been around 190 centimetres and as there is a kahikatea still standing in Pirongia Forest (close to where we were living) measuring around 220 centimetres in diameter, the comparative figures make sense – the confusion existing in my mind because it is almost impossible to find kahikateas of this size and age still standing for comparison. 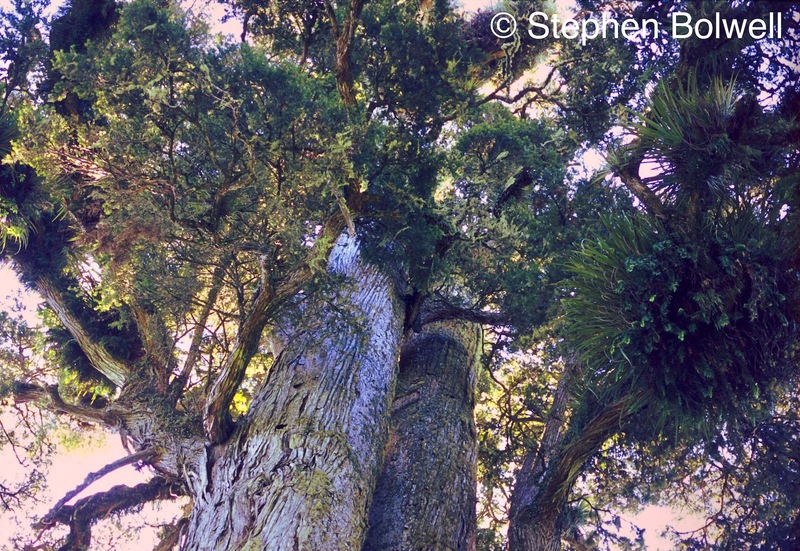 This great kahikatea in Pirongia Forest was once thought to be the tallest tree in N.Z. but that honour is now claimed by a kahikatea that when last measured in 2009 had reached around 55.50 metres in height (depending on whose figures you believe). It is sited much further south near to the Matirangi Forest in Taranaki. I planted quite a few locally grown seedling kahikateas at our place in what I considered appropriate places, but it will be the offspring of these trees that will decide where they really should be growing and the roll they will play in the future of the forest. 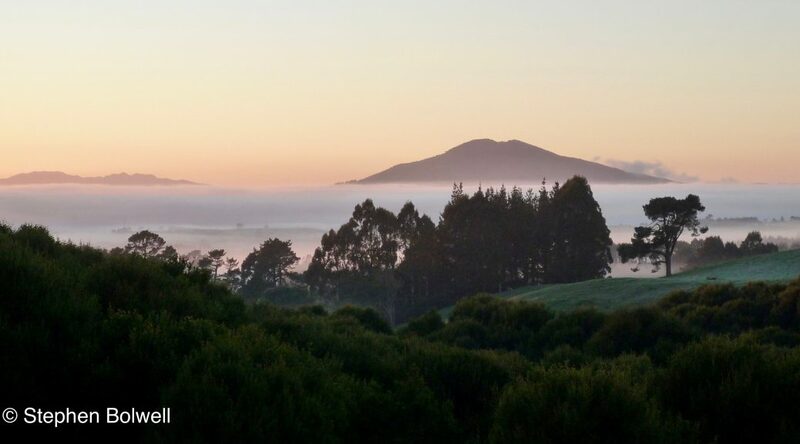 When we lived on the slopes of Pirongia Mountain, visiting friends would plant native trees on our land, amongst them kahikateas – which rewarded us by looking completely dead for several years – it’s just the way they are. This species was largely cleared from the once boggy surrounding lowlands of the Waikato as the wetland forest were converted almost exclusively to pasture. In some places, the occasional kahikata had been left standing on pasture to provide shade for livestock, but a few years ago it was suggested that cattle gathering in this manner might spread facial eczema, and for that reason many of the remaining trees were felled. On the school run I’d mourn their smoking carcasses piled and burning for days. Removing them I think was a mistake – shade for livestock is essential during the hot summer months, but as any farmer might be inclined to ask – what do I know? Bush developing behind our house, the edges sealed in just a few years by native planting to prevent wind damage to exposed trees. 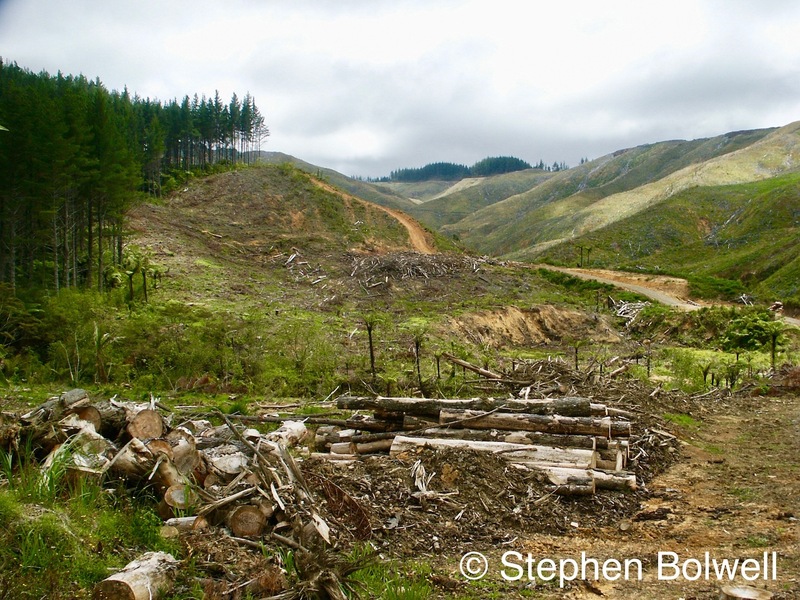 Certainly I was keen to see the trees back, as 98% of kahikatea forests are now lost, and without a reversal of policy in both drainage and land use the situation is unlikely to change. Some consider it immoral to return pasture back to natural habitat – a mind set that unfairly labels many New Zealanders as incapable of making a living from anything unless it can be shorn, milked or eaten. By the year 2,000 these Islands had experienced twenty to thirty generations of human presence – if we accept that Maori started settlement around 650 to 750 years prior to that date; during that period native forest has been reduced from around 85% to about 23% of the total land area. When we arrived in 2002 there was no national Forest programme in place. Decisions were made regionally and grand old native trees were still being cut, even though outside of conservation areas there were very few mature native forests left. A Maori visitor told me that an old relative of his was busy felling an extensive area of native trees – he said, ‘There’s no point in arguing with the old B… He wants them gone. What can you do eh?’ A neighbour who had recently bought a large area of farmland close by told me that he had the right to cut a percentage of his remaining native trees, even though the previous owner had pretty much taken out most of what had been left standing. Essentially, the land had been asset stripped, and indiscriminately sprayed with herbicide, killing areas of natural bush, and generally poorly maintained. It was then sold on as real estate values rose. A win, win situation as land prices rarely go down. 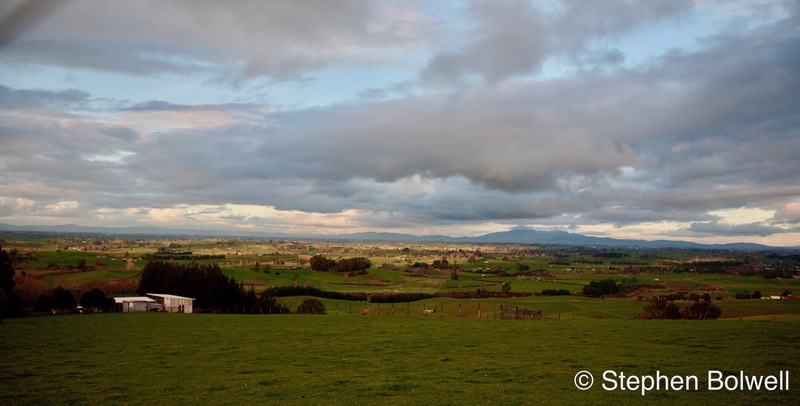 Looking across the Waikato Plain to Pirongia Mountain where we once lived, it is clear that all of the native forest has been replaced by pasture – little that is natural remains at lower altitudes. Whenever we came down from the mountain reserve, it was possible to see – where the pature began, as the streams and rivers changed from pristine clarity to cattle poo brown. On arriving in New Zealand I thought it odd that there was a general acceptance native flora and fauna could only be preserved by fencing it off… shouldn’t the natural world be on the outside of the fence? The alternative was to place New Zealand’s unique natural wonders on small offshore islands after all of the troublesome mammalian introductions, such as stoats and rats, had been exterminated by mass poisoning. In fairness this has proven to be an essential short term measure, so inundated has the country become with introduced pests. Certainly, New Zealanders can’t be faulted over their good intentions when it comes to pest control, but there is no excuse for the continued decimation of native habitats as agriculture continues to expand into areas that are borderline as regards economic return. 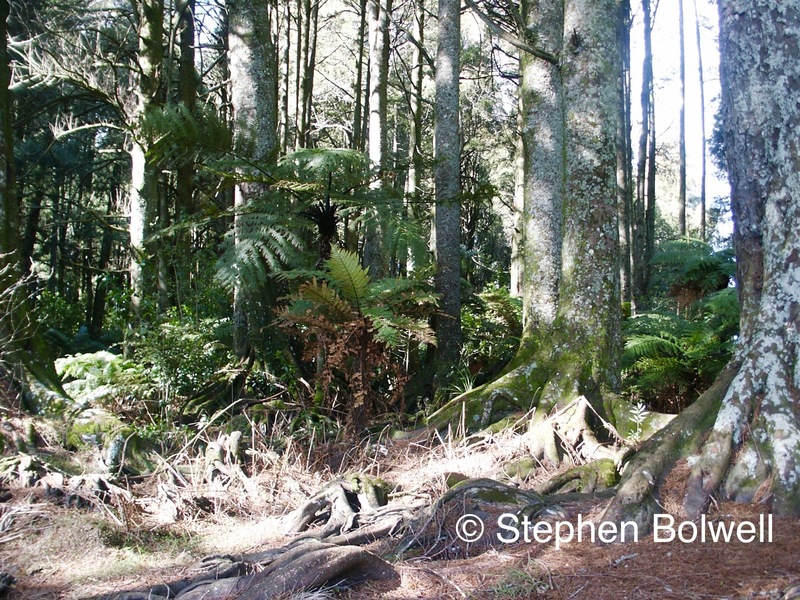 Yarnley’s Bush: A woodland area of mainly kahikatea and pukatea trees that still exists in a lowland area close to where we lived – its survival little more than a fortunate accident. This natural habitat is small but nevertheless precious. Buttress root are an adaptation that allows certain species to stand in boggy wetland areas; the trees here are impressive but have a long way to go before they are fully grown. Pukatea Laurelia novae-zelandiae commonly grows with kahikatea on wetland areas of the open plain which has long since been drained, but they will also grow on the lower slopes of the mountain. 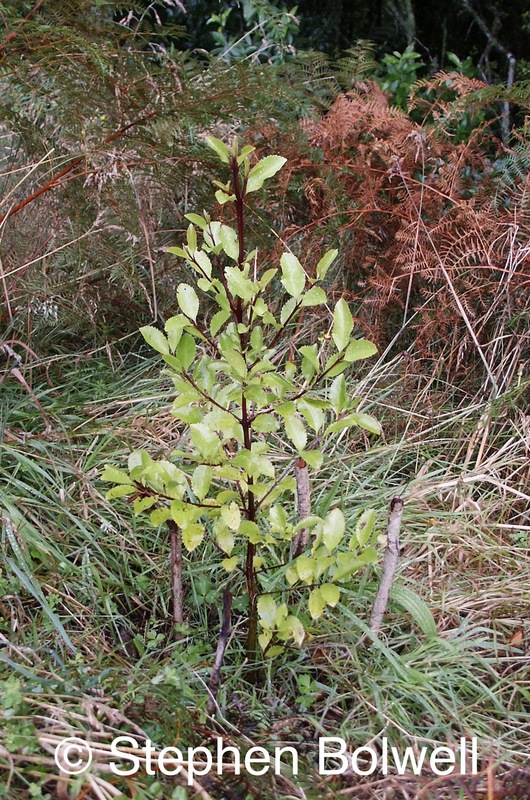 All of the seedlings that I planted were sourced locally – it took a couple of years to discover the particular preferences of pukatea – surprisingly they did not do well in the wettest areas close to the stream, perhaps because light was a limiting factor, but they did grow effectively at the top of the gully on retired pasture. There was once a woodmill close to our bush, and by the time of our tenure most of the important old trees had been logged out. The steep gully slope, close to where our house was sited, was supported by fairly mature kamahai and towhai trees which had only remained standing because their wood was quite useless – I was told by a local that had the trees been good firewood, they would have been felled long ago. In other places where there were no larger trees growing, the gully would occasionally slip away in wet weather. It really doesn’t make sense to cut mature trees on steep slopes and yet this is an activity that continues around the world, with often shocking consequences. Towhai and Kamahai trees were important features on the steep gully slopes, because their roots stopped the hill from sliding away. The trees flowered annually, and once every three or four years they would put on an exceptional display. 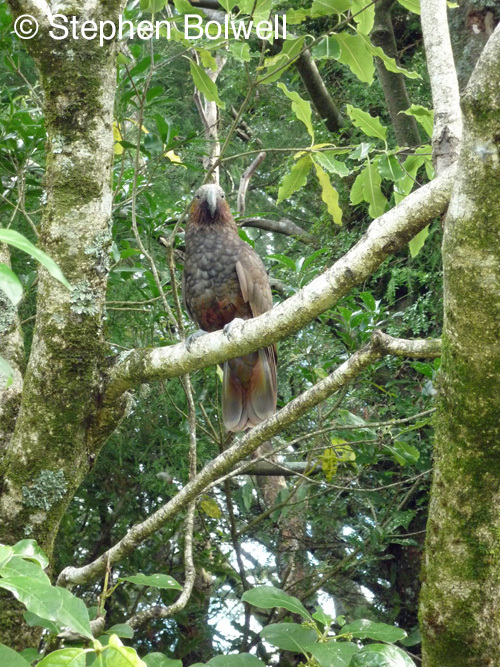 The presence of the trees also provided a roost for a couple of pairs of native pigeon, big birds and the only species surviving in New Zealand with a crop big enough to swallow seeds from the larger tree species that had mostly been lost from our tract of bush. Stock animals would wander down to the stream and surrounding bush, but we put a stop to that. After a couple of years without grazing, large numbers of seedlings began to grow in the understory, carried in as seeds and excreted onto the forest floor by our welcome avian visitors. Rewarewa Knightia excelsia is establishing with thousands of other seedlings in the bush, they require a layer of cover and cannot survive winter frosts a few feet out on open pasture. The dense mass of seedlings growing in open spaces in the understory will eventually sort themselves out by competing with one another, but it could be a hundred years before the winners crowd the losers out. As new generations of people come to live in the house they will experience different stages of the forest as time passes, and in two or three hundred years the habitat will begin to get really interesting – but only if we humans stops messing things up as effectively as we presently are. Hopefully, little pockets of forest like this will survive undisturbed elsewhere, until eventually much larger forests develop to full maturity. Native forests perform various important functions – in particular they provide habitats for other native species; and will also lock up carbon and slow the present increase in land temperatures. All we really need to do is allow them to exist without interference by keeping stock animals out and avoid the temptation to rush in and chop mature trees selectively. This requires a very different mindset from the short sighted approach we presently exhibit…. who knows, it could happen, but I’m not holding my breath. When researching native trees I was concerned to discover that almost none of the original buildings in our local town had been preserved… Obviously a case of local indifference… but sometimes a little knowledge is a dangerous thing – it soon became apparent that there was a good reason for the lack of historically significant structures – most of the buildings had been made from kahikatea timber – a wood that rots out very quickly. Local Maori would have known this, but probably nobody thought to ask them as they were often in conflict with the first European settlers, and might have been disinclined to offer useful information. The wood did however have one thing going for it – no discernible scent, and this proved ideal for the making of boxes for the transportation of butter. Down in our gully, growth was dense in places, but the soil is susceptible to being washed away, and it will take time for things to mature. An establishing young Kauri in our gully. This species once grew close to the property, but maybe not on it. On the Coromandel the large scale plunder of kauri forests started in earnest back in the 1830s. It was commonly referred to as an ‘industry’, although the almost complete destruction of a unique ecosystem might more correctly be described as a tragedy, but it was correct in one sense in that the destruction was on an industrial scale. By the end of the 19th Century 75% of the forests had been felled, yet the rate of cutting would increase for a while. In the end it would take little more than a hundred years to destroy forests that had been in existence for perhaps 20 million years. Many tree species had been logged out in our bush, and I re-established them over an eight year period between 2002 and 2010, including several kauris planted on forest margins, previously sheep pasture. 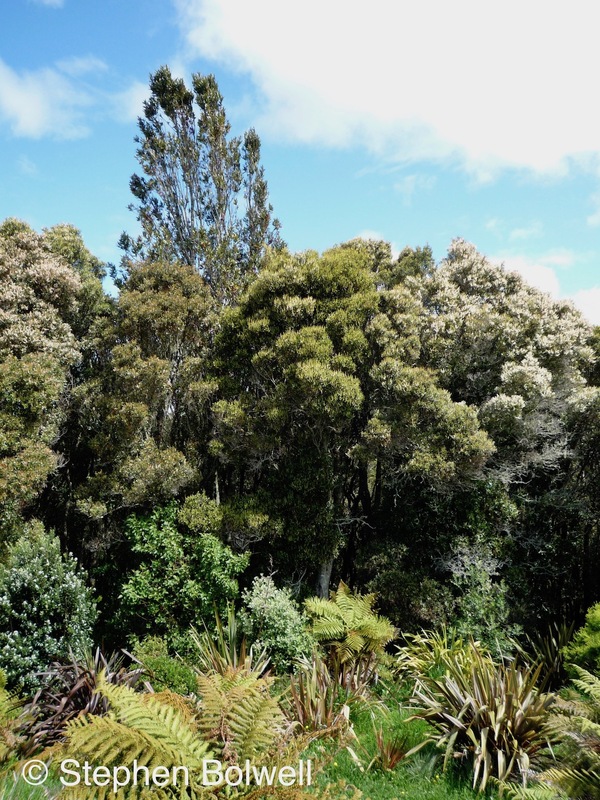 Kauri have recently suffered from a disease known as dieback for which there is presently no cure, and there can be no harm in having small stands of these trees in out of the way places as an insurance for the future. Kauris can live for more than 4,000 years, their upper canopies growing so expansively they may be considered complete ecosystems in themselves. There are few big old trees standing now that haven’t been given names and that’s a bad sign. When people can remember the names of every big tree in a forest there’s probably an environmental crisis. Big trees on a grand scale can now only be found in conservation areas much reduced in area from their original forest size. I was working hard here framing native plants rather than pasture to make Cathedral Cove look as if it belongs in N.Z. and is not as it appears, an overgrazed stretch of Dorset coastline. 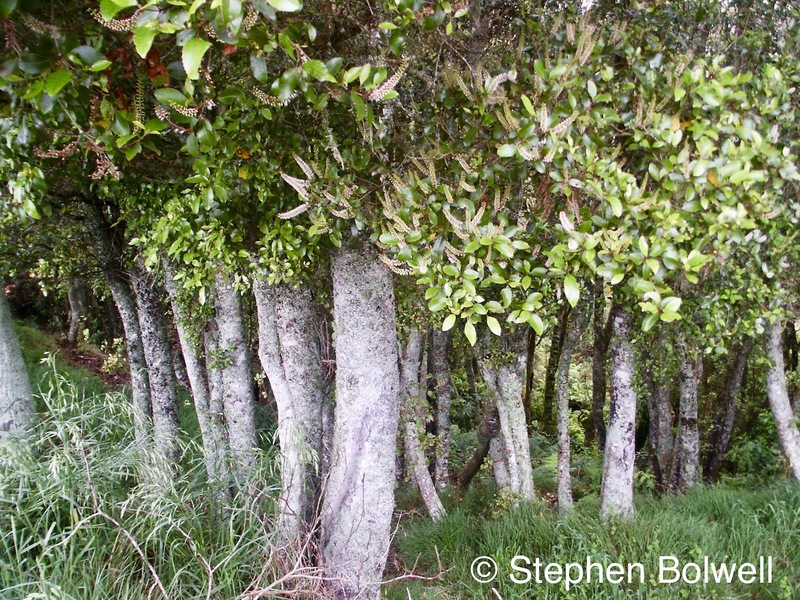 The double whammy for kauri on the Coromandel was the discovery of gold in the mid-1900s. 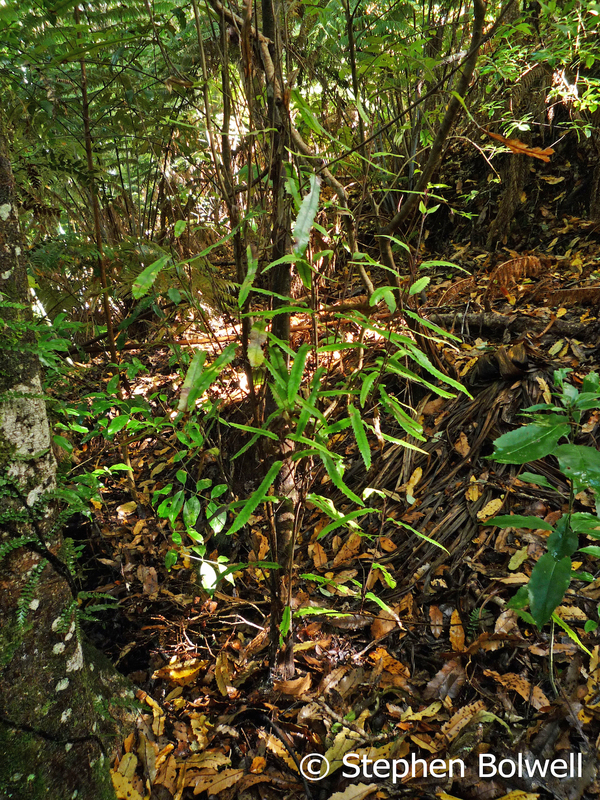 Just when kauri seedlings were beginning to start another forest their top soil was blasted away in search of a metal considered far more precious than natural bio-diversity. Extracting gold has in the past been a dirty process and has involved considerable changes to the landscape, with the use of a great deal of water and rather alarmingly, liquid mercury – the worst news imaginable not only for people but also the environment. Then in 1898 the cyanide process was trialed for the first time at Karangahake on the Peninsula. This involved using dilute sodium cyanide to dissolve and separate gold from its ore and is still in use today. Commonly, tailings ponds are utilised to allow for settling with the water then available for re-use, but now and again there have been breaches that can cause environmental problems, and the ponds themselves are not ideal places for sustaining wildlife. Mining companies however manage to put a positive spin on the use of cyanide, because cyanides do not cause cancer or build up in the food chain, neither do they persist in the environment as some pesticides do; eventually breaking down in sunlight. However, when things go wrong, there is an obvious cause for concern, either from airborne hydrogen cyanide or the contamination of water supplies. 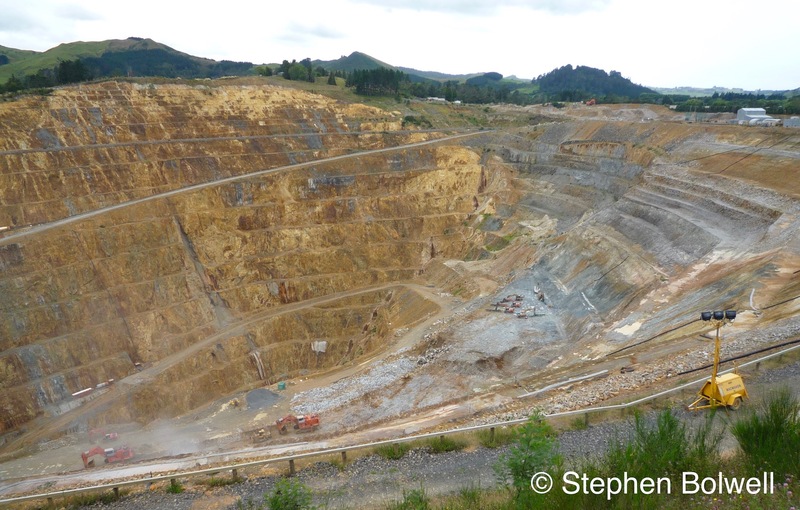 That’s not to say that all goldmines are potential environmental disasters, but I wouldn’t want to live next to one. Gold, of course, has easily definable important industrial uses, but if we are going to keep most of it in vaults or under our beds, we might just as well leave it in the ground… What a ridiculously common sense idea. A gold mine can be a shocking thing, especially when you haven’t seen one before. This hole in the ground is literally part of the township of Waihi south of the Coromandel Peninsula. 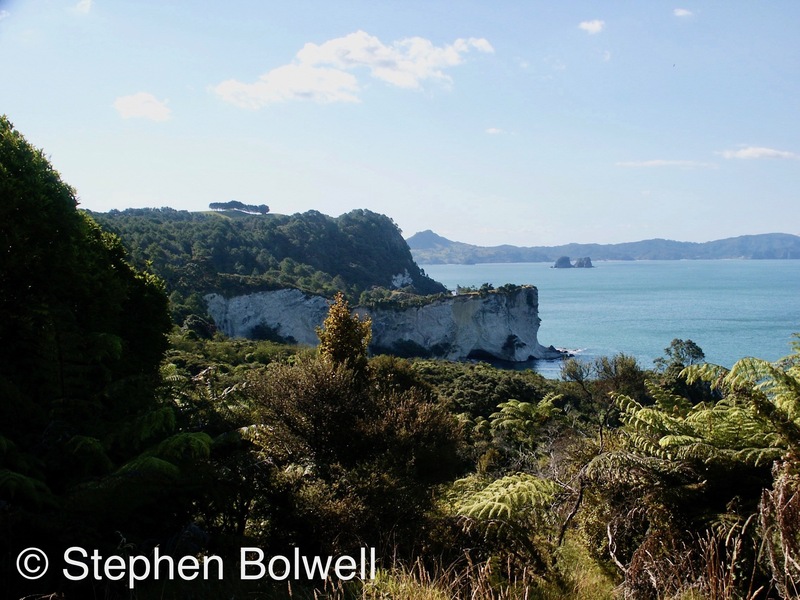 Just a few hundred years ago the Coromandel was a great natural wonder. Maori certainly made their mark, but after the arrival of Europeans, things got worse. Logging, and later, the extraction of gold by blasting the land surface with water, was followed by chemical extractions that could seriously damage biological systems, and finally large areas of the peninsula have been converted to pasture. All of this has resulted in a wide scale environmental disaster that many chose to ignore, or at least fail to notice. Now that things have settled down and the region expansively clothed in either pasture or monocultures of pine, so much of it looks just like a long distance relative of Britain, but in the past it has been so much more. Many people still love it, but historically little respect was given to its once unique and pristine environments. The Coromandel clearly missed out on the care that it more properly deserved and I don’t understand why people aren’t angry about it. The destruction happened recently and over a comparatively short time, nevertheless, many New Zealanders have no understanding of how their country once looked. And, if you point this out…”Well, what can you do? It’s the same everywhere isn’t it?” is a common response. It is anathema now to suggest that we should be responsible for what happens around us; an attitude that makes almost anything more or less O.K.. But if natural environments are to survive in the years to come, ignoring all the stuff that we’d rather not think about isn’t the answer. Kaka parrots will eventually return to the bush close by where we once lived, but it will take time for the environment to become exactly right. 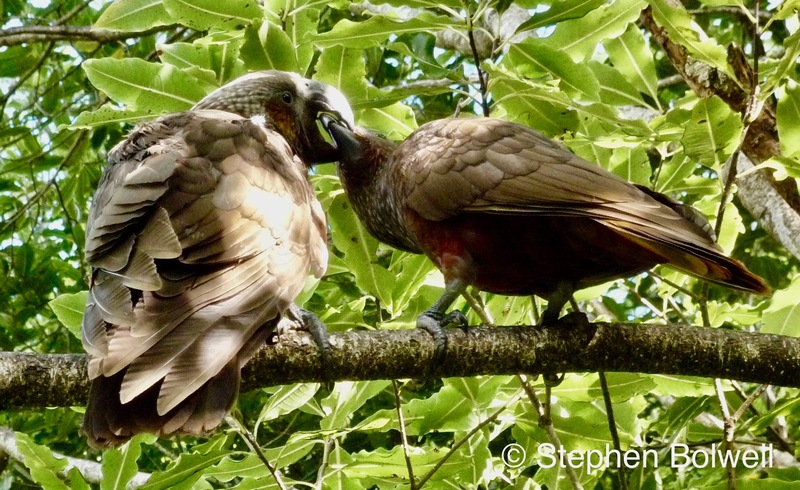 These are hungry destructive birds and there are very few places in New Zealand where, if this parrot occurs in numbers, they are not artificially fed, as too few places now exist with enough mature trees to support the fruits and seeds they require. Clearing out the pests is just the start, the next stage will be to reinstate New Zealand’s forests. Maybe people refer to any natural area as ‘bush’ simply because there are so few mature trees left and so it is difficult to realistically call them ‘forests’. At least some recognition of this will be necessary before there will be any significant change. If cameras had been around when Cook was exploring remote places unknown to Europeans, would pictures of magnificent forests have changed attitudes towards chopping them down… Probably not, because we have great pictures of Indonesian rain forest now and the wonderful plants and animals that live within them, but nothing much changes – presently, palm oil plantations take precedence over natural bio-diversity… It doesn’t make sense, but if there are still great forests with grand old trees standing within them, then it’s worth taking a picture, because one day there will be deniers who will try and tell us that they were never really there. To follow: PART 2. The Downside of Pacific Islands – The Disappearing Species of Hawai’i. HAWAII: JUST ANOTHER DAY IN PARADISE. PART 1 – IT’S THE LITTLE THINGS THAT COUNT. On a recent visit to Hawaii, I hardly saw any native wildlife, a stark reminder that things haven’t improved since I first came to film for the B.B.C. back in the early 1980s. Thirty five years ago I made my first visit to Hawaii at a time when travelling to distant tropical islands from the U.K. was considered exotic. In those days, you’d emerge from a plane into the shimmering light and once down the gangway steps walk to the terminal building with the heat of the sun bouncing beneath your feet like a playful pet; and just as you were beginning to appreciate that life was all the better for being here, smiling girls in traditional dress would come out to greet you and place flower leis around your neck. But things have changed… the sun still shines, but on more recent visits I couldn’t fail to notice that the girls were no longer present – the Honolulu Airport terminal is bigger now, reflecting that there are many more travellers coming to Hawaii and if every visitor was still receiving a traditional floral greeting, the islands would pretty soon be clean out of flowers. People still smile though, and the pace of life is slower than many of us are used to; pretty soon you feel relaxed because it’s difficult to find these islands anything other than enchanting, but my first couple of visits were not the magical encounters with paradise that I had imagined – mostly I was filming ten hours a day in a laboratory at the University of Hawaii. I’d been sent by the B.B.C. to film a variety of tiny creatures and two oddities in particular – both spectacularly unusual carnivorous moth caterpillars. Anything that has a sensory rear end that alerts to an approaching fly and then flips its front end over backwards to grab the unwitting insect in its jaws in a mere fraction of a second is a real attention grabber, but the little critters are just so small and well camouflaged, that if you didn’t know they were there, they’d might just as easily be another twig on the tree. Where else but in Hawaii could you find an insect so clearly associated with feeding on leaves that has switched to eating insects? And not just any insects, in this case Hawaiian fruit flies that have evolved to become spectacularly large, but nevertheless will go down twitching as they are eaten alive. 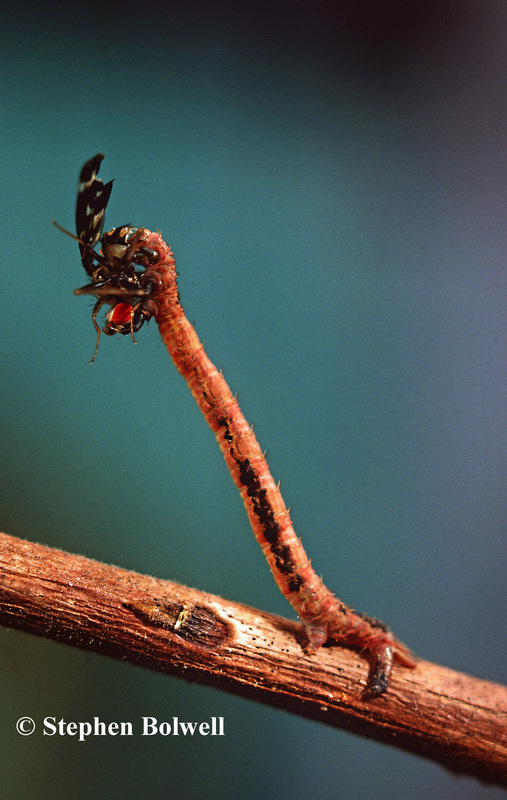 It doesn’t seem likely, but there it is… the moth caterpillar Eupithecia streurophragma feeding on an Hawaiian fruit fly. Hawaii is an extended chain of islands which has formed over a mid-Pacific hot spot of volcanic activity, roughly equidistant between Eurasia and the Americas; and to get to either requires an approximate two and a half thousand mile journey either east or west across the Pacific Ocean. It was this creation of land by fire combined with a perfect storm of circumstances that allowed for the evolution of so many unique and unusual lifeforms. These Islands might be regarded as a natural laboratory for the study of evolution, and if Charles Darwin had landed here rather than on the Galapagos Islands he would have come to similar conclusions about how species evolve when separated from their relatives on distant mainlands, and even from those isolated on different islands… but Darwin would have needed to be paying attention (clearly one of his strengths), because many of the animals concerned are small invertebrates, such as spiders, insects, crustaceans and molluscs. Certainly limited numbers of creatures would have made it to the islands to start the evolutionary ball rolling and no large animals were amongst them – other than those that could swim here – turtles for example, and they never get further than the beach. Consequently no native reptiles, amphibians or mammals ever made it to the islands until their arrival alongside man, either as stowaways or transported intentionally, with frequently disastrous consequences to the native flora and fauna. Small arthropods such as insects, spiders and crustaceans will most likely have arrived on floating vegetation, the lucky winners hitting this narrow window of opportunity, whilst the majority missed the jackpot and drifted on across the world’s largest ocean to become lost at sea. The initial arrivals had the advantage of making landfall on uninhabited islands which provided a variety of empty niches ready to move into – and those that managed to adapt to their new circumstances would have radiated out into different habitats to eventually form species that were unique. 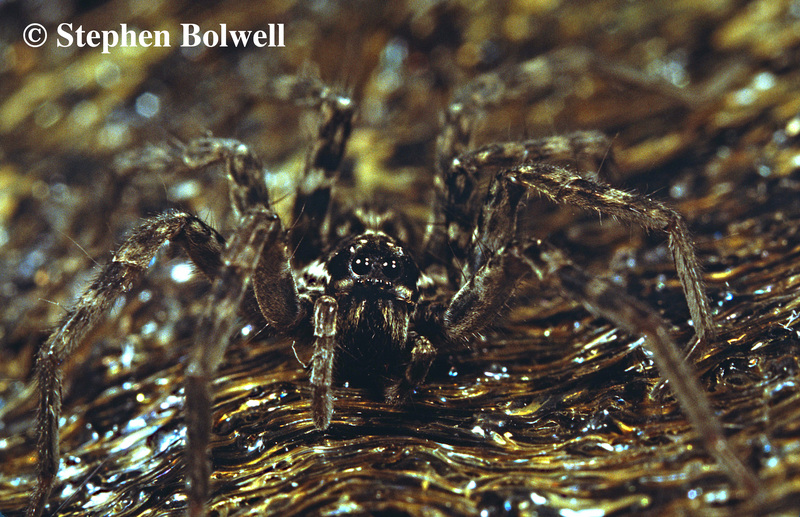 The Hawaiian Islands were at one time or other no more than volcanic larva flows and it is no surprise that the wolf spider Lycosa has evolved adaptive colouration to live in what might elsewhere be considered unusual surroundings, in particular larva cinders in desert areas. 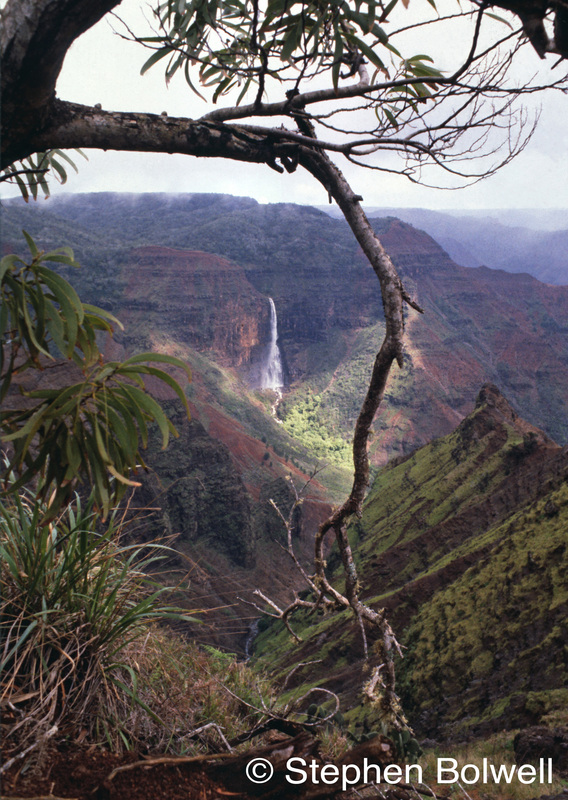 The habitats available for life in Hawaii were varied, and included not only forest, grass and wetlands, but also larvae flows, deserts, beaches and caves – all of these would become populated by invertebrates; there is even an small creature (the wekiu bug) that lives at altitude, sucking the juices of insects that have been caught up and preserved in snow and ice to be released many years later as frozen dinners along the thaw line of Mauna Kea, a dormant volcano and the highest point in Hawaii. A cricket that appears so well camouflaged on larva flow that I could just as easily have photographed only the larva flow and just pretended it was there. 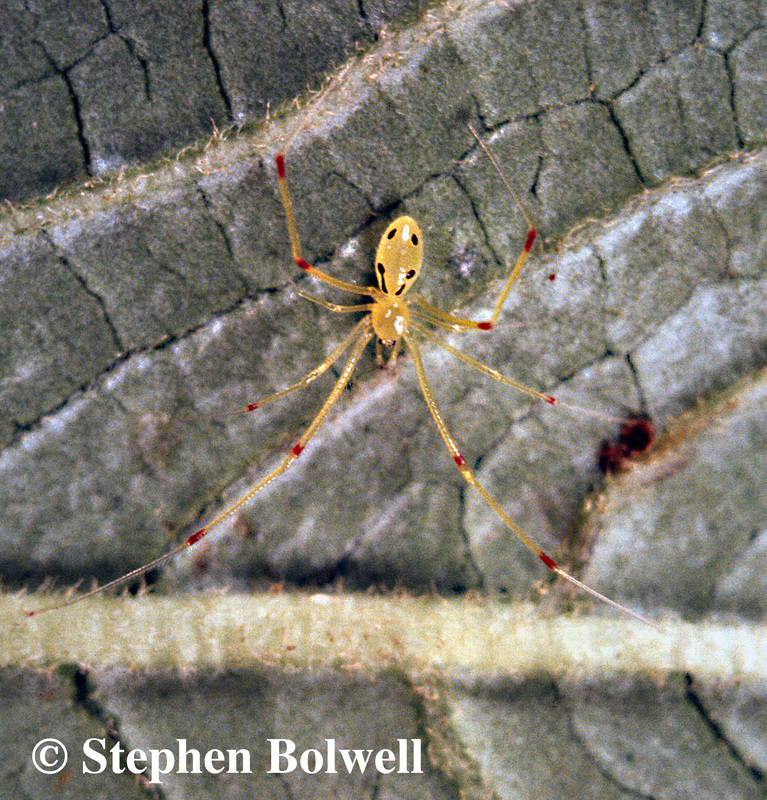 One species peculiar to the Islands is the happy-face spider, which derives its name from an apparently smiling face on the upper side of its abdomen; this tiny spider mostly lives and hunts on the underside of leaves and despite its size is visuality impressive. The morph shown below is the one most commonly seen, but there are a variety of others that have extraordinary clown faces on their rear ends and you might want to Google ‘ happy face spider images’ to see more impressive examples. The spiders have made it onto four Hawaiian islands but are not yet on Lanai, nor have they managed to get as far west as Kauai. In 1980 I had only a couple of happy-face spiders to film – the disappointment was their small size, which made filming their behaviour a challenge. It appears that almost everything that arrived in Hawaii evolved into something special… but then man arrived and the party was over, which is a sad but familiar story! The islands by dint of their remoteness have undergone extraordinary speciation in the absence of too many predators or competitors, but once these were brought in from elsewhere, many native species were immediately threatened. Indigenous plants and animals have become well adapted to their circumstances but they have not evolved appropriate defences against the onslaught of the new invaders. And so it was, that species in existence for millions of years, were snuffed out by the newcomers like candles in the wind. Many of the new arrivals were so closely associated with man and his agriculture that with the additional advantage of a perfect climate they thrived in their own little paradises within paradise – and from there ventured out to invade other places on the Islands. The first aliens will have come in with the Polynesians between 300 and 500 A.D. Then the Europeans showed up; it is possible that the Spanish arrived a couple of hundred years before Captain Cook made landfall in 1778, but it is Cook that we remember because he claimed the Islands as British territory, which now counts for little more than the hoisting of an interesting union flag colonial combo. 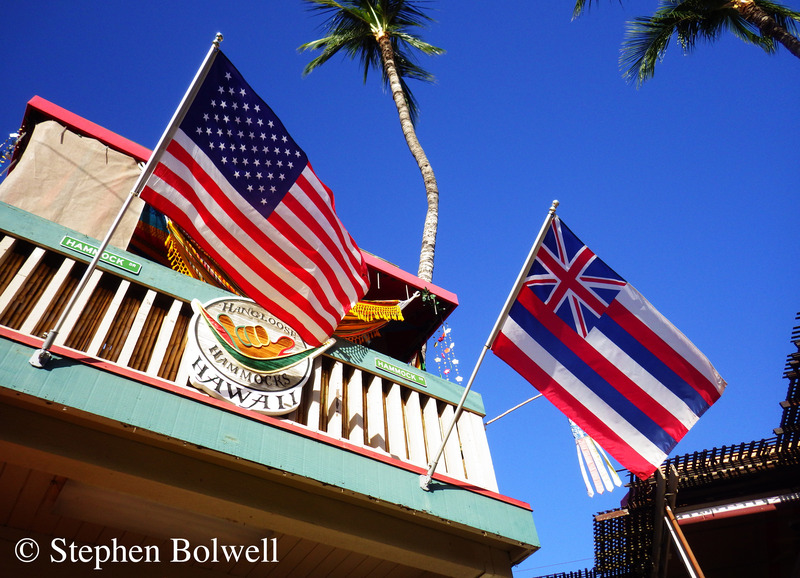 Flags are not traditionally Polynesian; these two flutter beneath an Hawaiian sky – a reminder of the transient nature of colonialism. The islands were named after Cook’s sponsor, the 4th Earl of Sandwich – the very same Earl who found himself disinclined to leave a gambling table and suggested to staff that they bring him food conveniently held between two pieces of bread… the rest of course is history… as is the case for the naming of the Sandwich Islands which later reverted to their more appropriate Polynesian name – or at least a close approximation to it. Colonisation would be instrumental in the devastation of many indigenous species causing the rapid degradation and destruction of habitats; this combined with alien introductions became the driving force for many island extinctions. It was decided that I would film snails to illustrate the troubles caused by introduced species and I was pleased to be filming at least some of them out of doors. There are many valid reasons for filming animals in their natural environments, but invertebrates are often the exception, usually their behaviour is not much affected as long as their living conditions are adequately simulated. Prior to the early 1980s film stocks were limiting and a lot of light was required to capture the activity of any small creature in movies. This was just before cold light using fibre optics became widely available, and I had to devise my own water cooling system bolted to the front of lights which required a constant flow of cold water to substantially reduce temperatures. In the years to come I would replace my cumbersome system with cool fibre optic lights; this was really helpful because invertebrates can’t cope with excessive heat, but rarely are they bothered by extra light, and for the best results good lighting was essential. 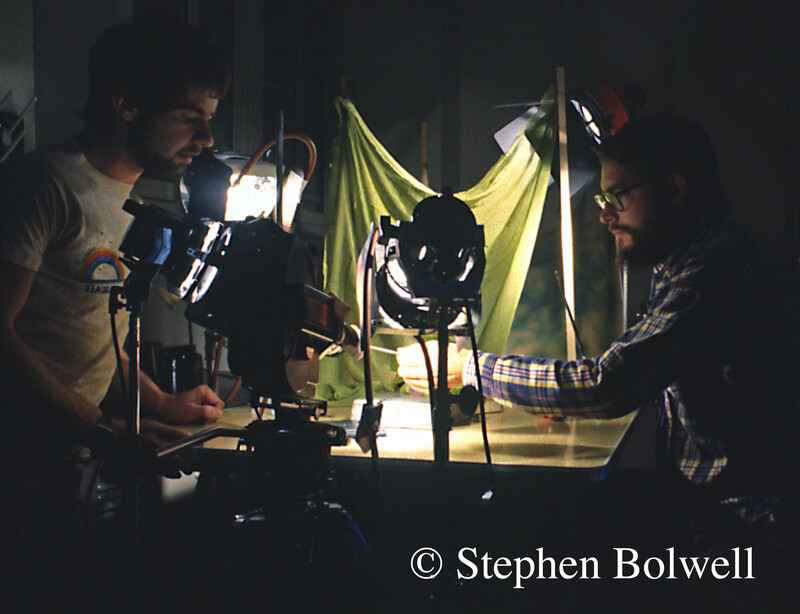 Filming in the lab (way back when) with Steve Montgomery (right). We are checking that the carnivorous caterpillars are happy under my water cooled lighting system – not long after, cool fibre optic lighting became available. There is also a moral question as to whether this is truly wildlife photography, but imagine carting all of this gear into the big outdoors to capture perhaps fifty different creatures in various locations across the islands – setting up on steep slopes for example – because hardly any fertile natural environments have escaped cultivation on the flat – and then there are the cave habitats which are a nightmare to get equipment into. Time and budget constraints required everything to be done in a few weeks (and today these constraints are even tighter). There was then little option other than to bring many of the smaller creatures to one place in order to get the job done. Taking a still flash photo on location is one thing, but filming the very tiny with plenty of light without any vibration has always been a wind up, and there is the additional problem that when visiting delicate environments trampling has to be avoided, along with the possibility of losing invasive species to the wild. Back then, despite all the disadvantages that the real world presented to macro-photography, I still had to establish some environments on wider lenses and in the process was determined to film at least some of the native snails in the big outdoors. I was once embarrassed to lose a large tortoise whilst filming in Africa – it made off (across its natural habitat) when I left for a short while to fetch a lens – I had assumed that it wouldn’t get too far, but of course, tortoises run at breakneck speeds when you stop watching them. I learnt a valuable lesson… but even at my most inattentive, I thought it unlikely that I could misplace a snail, not even a well camouflaged individual, but the truth is, it’s easy to lose sight of almost any snail by simply looking away… and given half a chance they’ll dash off and hide under a leaf when you do. Living in a small world – your perspective on life changes and when you’re not worrying about snails rushing off to hide, you’re worrying about the fact that some move so slowly they won’t register as moving at all in real time. But of course, things could have been worse… ants are always in such a rush, so it was great to discover that there are thought to be no native ants living on the Islands at all. 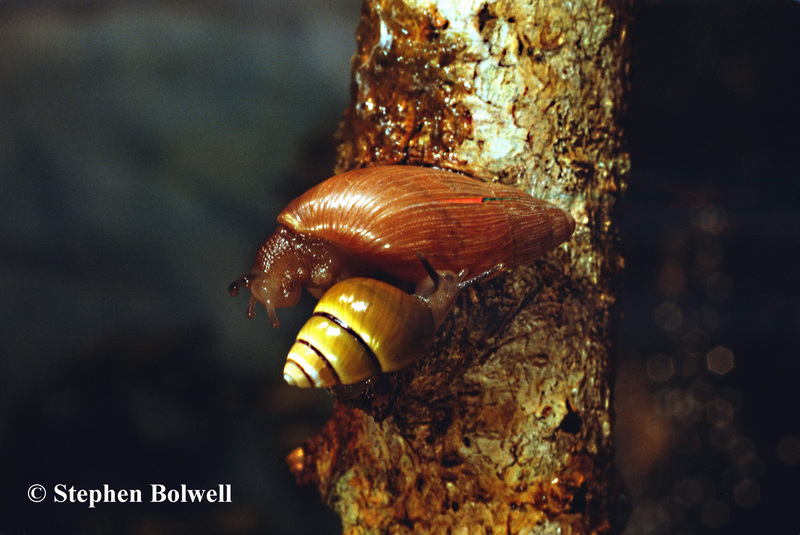 There was once around a hundred species of tree snails in Hawaii and now only about a quarter remain – most of which are endangered – and this one seems hardly to have held on to a protective shell at all. Until recently Hawaii held the most diverse representation of land snails anywhere in the world, but since the arrival of humans it is likely that around 75% have become extinct. Habitat loss will have played a part, but many have been eaten out by introduced predators, in particular predatory snails. After the African land snail Achatina fulica was introduced – it’s a monster and ends up elsewhere either as a food source or as a pet – it soon became clear that the newcomer was munching its way through the Hawaiian natives, and so another predator was introduced from Florida – the rosy wolfsnail (Euglandina rosea) to control it – and there wouldn’t be much of a story unless the new arrival had set about the native snails even more ferociously than the problem snail it had been brought in to eliminate, which of course it did, reducing native species even further, and pushing some to extinction… This was without doubt a ‘doh!’ of Homer Simpson proportions. It is clear that when humans get environmental issues wrong, they make a really great job of it, and often eliminate species that have evolved to become spectacularly different from anything else on the Planet. The problem is, that when this happens to invertebrates… hardly anybody notices. 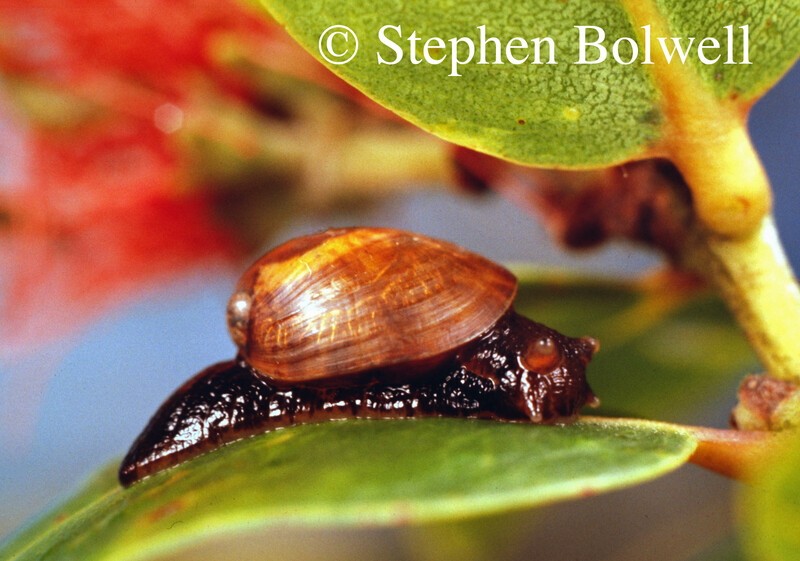 A native Hawain tree Snail (below) does the dance of death with an introduced species – the rosy wolfsnail Euglandina rosea which predates upon the unfortunate natives. It is the larger cuter animals that usually grab our attention, but when it comes to extinction we need to consider the smaller things in life, because if we include them, the losses that are presently occurring on a worldwide scale indicate that we may be entering a mass extinction event. Long term, this makes no difference to the Planet, but species diversity remains the best measure of the prevailing conditions for life on Earth and that is an important consideration for all of us. Our own well being can be gauged by what is disappearing around us, and it is possible that any who travel might at one time or another hit the jackpot, and take a picture of some small creature that is unknown to science. Seeing the bigger picture means looking out for the small stuff, which is one of the best ways to save the Planet… or more precisely… the life upon it. Next: HAWAII: JUST ANOTHER DAY IN PARADISE. PART 2 – INVASIVE SPECIES. 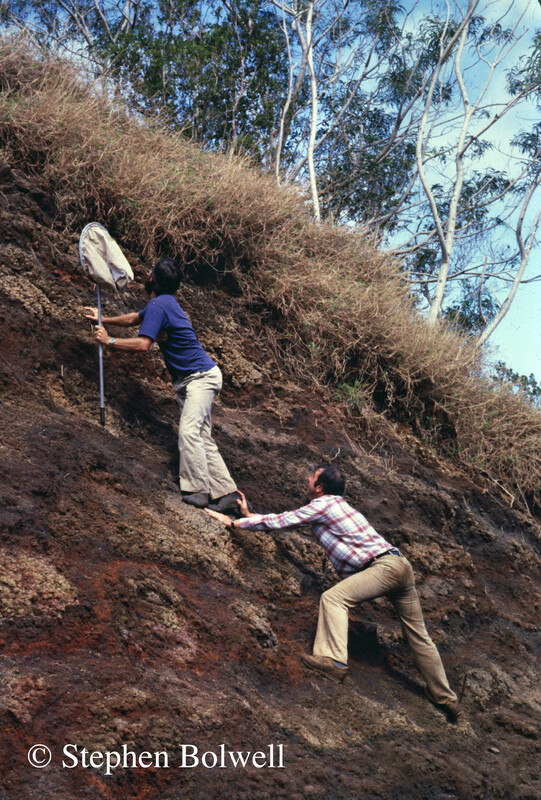 Roger Jones supporting Steve Montgomery (with the net) collecting specimens for filming in Hawaii -1980. With thanks to former BBC Natural history producers Richard Brock and Roger Jones who gave me my first opportunity to film the natural history of Hawaii, Ken Kaneshiro for fruit flies and lab space, Frank Howarth for his cave critters and Steve Montgomery who collected many of the specimens for filming; he has been foremost in discovering many new species on the Hawaiian Islands and continues to do great work bringing the uniqueness of island biodiversity to the rest of us. When In Doubt – Go To The Beach. Are we too Stupid to Save the Planet? Part 2 – Beyond Rational Thinking. Are We Too Stupid to Save The Planet? Part 1: The Limitations of Perception. 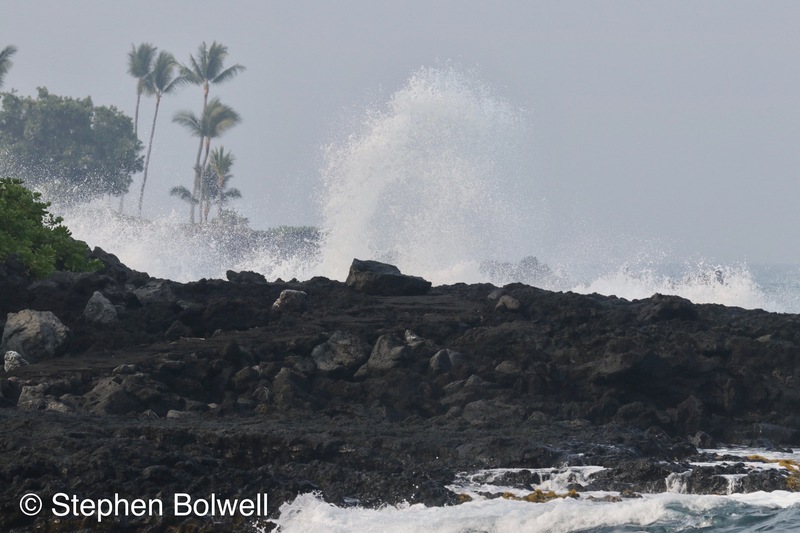 The Down Side of Remote Pacific Islands – The Disappearing Species of Hawai’i. Stephen Bolwell on The New Forest’s Overgrazed Heathlands. 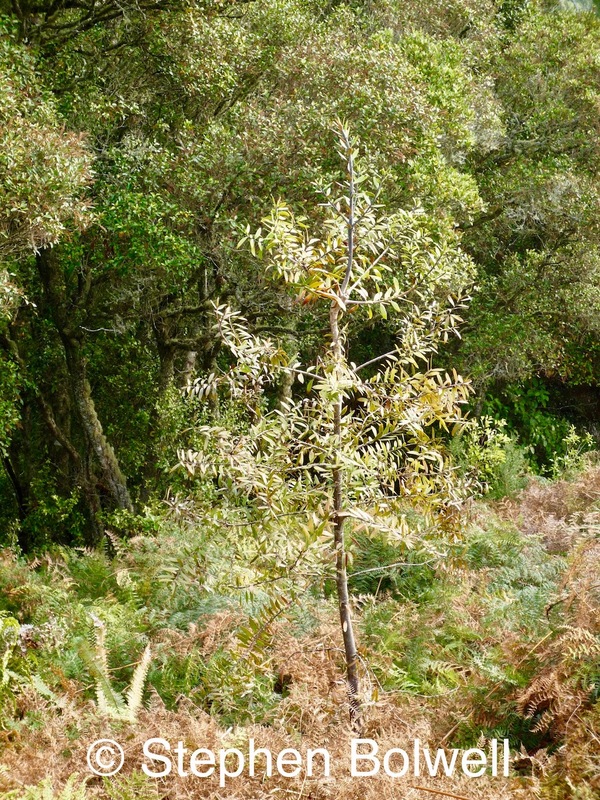 Patrick Webster on The New Forest’s Overgrazed Heathlands. Stephen Bolwell on Are We Too Stupid to Save The Planet? Part 1: The Limitations of Perception. John Gordon on Are We Too Stupid to Save The Planet? Part 1: The Limitations of Perception.